LeVue Photography offers professional portraits on any scale. If you live near New York City, or visiting, and looking for a Portrait Photographer in New York to service you with high quality photos via digital or physical medium, Photographer Gabriel Johnson and his colleagues will help! We specialize in Professional Business Headshots, Family Photography, Maternity Portraiture and Wedding Photography! We also have package deals available for businesses and families alike! With our maternity photography services, comfortability is key. Gabriel J. has spent many years becoming the NYC Maternity Photographer he is today. The approach comes around making the client feel at home, in order to get the best poses and smiles possible out of a stressed anxious mother. Naturally lit maternity photos are great, and can be done anywhere outdoors in NYC. Central Park, Brooklyn Bridge Park, Astoria Park, etc, are some of the places our maternity shoots have been done. Our maternity photographer also has a studio available in the city if you prefer a more creative and controlled shot. Either way, you'll get timeless, lovely maternity photos that will be irreplaceable. 1-hour to 3 hour sessions available. Let us know if you're interested in our NYC Maternity Photographer services. As a family man himself, Gabriel Johnson truly appreciates the art of family portraits. We understand our clients want photos that will tell stories about their feelings, stories about their lives. These photos need to capture joy, happiness, excitement, intensity and passion. 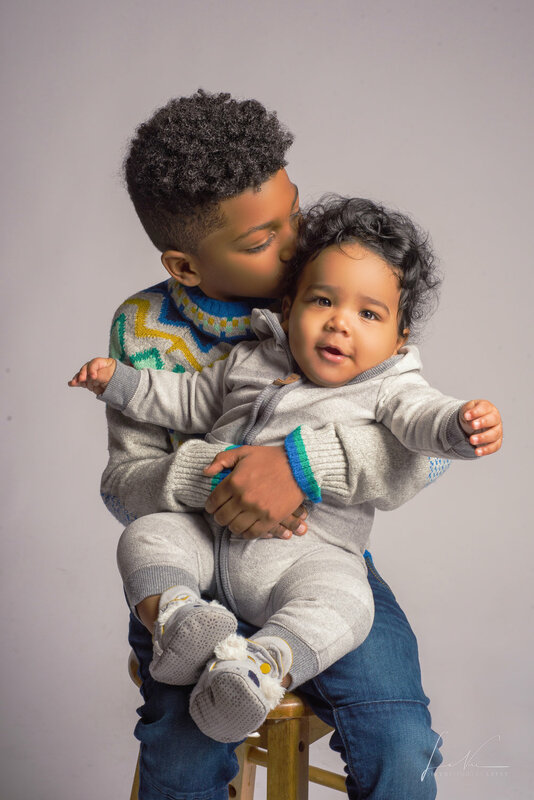 With Gabriel's 10-year background in the after-school environment, dealing with children and families is something he has great experience in, and he brings that experience over to his photography and implements it with every session. You wouldn't find a more understanding, fun, humble NY Portrait Photographer anywhere. With LeVue, you get a maternity photographer, family portrait photographer, and baby photographer, all in one. Couples share many memories through the course of the relationship. It could be a first kiss, first argument, first time you said "I love you" to each other, etc. Among the top memories you have in the life changing ranking, the Proposaland the Wedding, tops them all. We understand that you want a New York Wedding Photographer whose priority is to capture the memories. You inquire with LeVue and you will get a wedding photographer in NY whose is experienced and trained to take amazing portraits and make your special day. Gabriel J. will make sure your event gets covered and can provide multiple wedding photographers if needed. We'll cover your wedding ceremony, wedding reception, and also create beautiful wedding portraits before or after. Everyone needs a good professional headshot. Why? It’s usually the first image people will see when you are applying for a job, trying to get clients, or representing your business. Gabriel J. will make sure your headshot expresses exactly what it needs to express for your clients. With customized packages and various looks allowed per session, you will be glad you chose Gabriel J. to be your NY headshot photographer for your business. NY Family Photographer Gabriel J.